I am always on the look out for new Islamic children's books. When my eldest, who is now almost 8 years old, was a baby, they were so difficult to find and the books that were available were dull and lacked imagination. However, now there are many more available and the quality of the stories is rising. Ilyas and Duck books are written by Omar Khawaja, a father who set out to answer his children's questions about Allah in a fun and interesting way. The stories he has created tell the the tale of Ilyas and his friend Duck. Together they seek answers to fundamental Islamic concepts children are keen to understand. The first thing I noticed about these books is the high quality. The books are hardback with high gloss pages. The illustrations are stunning. Bright and beautiful, they make the characters come alive. The characters themselves are fun and relatable. Furthermore, the stories are extremely well-written and enjoyable for young children to listen to. Let me tell you about them. 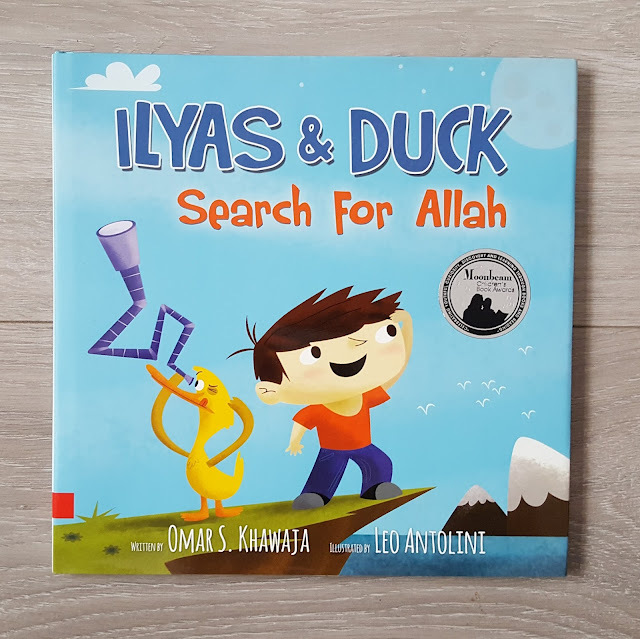 This is a delightful story about Ilyas and Duck's quest to find Allah. 'Where is Allah?' is a question the majority of Muslim parents will get asked at some point. 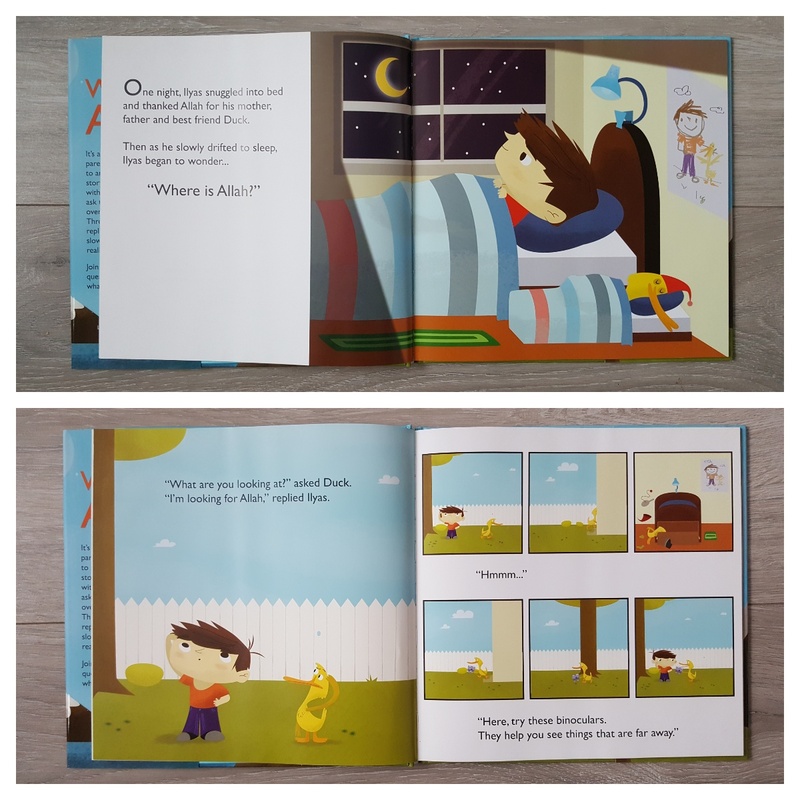 This book will explain to your children where Allah is. The story begins with Ilyas in bed thinking about Allah and where He could be. The next morning Ilyas begins his search in the garden looking up at the sky. He realises he cannot see Allah in the sky and goes elsewhere in his search for Allah. Along the way he meets animals and asks them where Allah could be. Each animal replies that 'Allah is all around us' but we cannot see him. The animals Ilyas meets, are not your typical animals, in fact, I had never heard of most of them before! I was slightly taken aback by this at first wondering how I was going to explain these animals to my children, but then I noticed there are pages at the end of the book explaining each of the animals. This is brilliant because it means the adult reading the book will likely be learning something new, along with their child. This book offers just the right amount of repetition young children love. They will soon learn phrases from the story and be able to join in with you while you read. 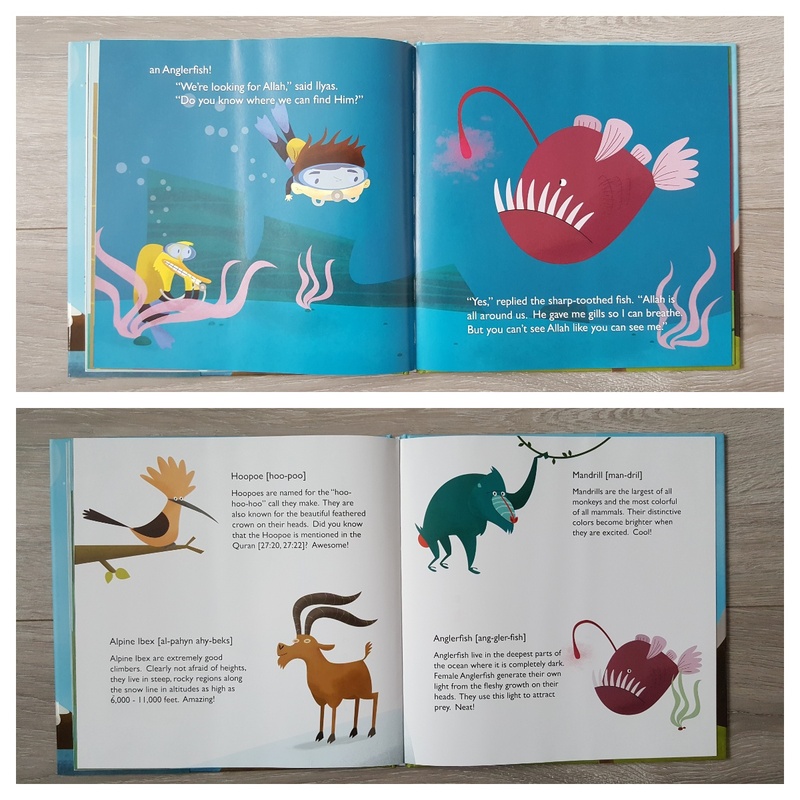 The story is educational, not only teaching children about different animals but also teaching them about the habitats they live in. Of course, most importantly, it teaches children about Allah, the creator of all things, who is all around us. This story is the favourite of my five year old and my two year old loves it too. 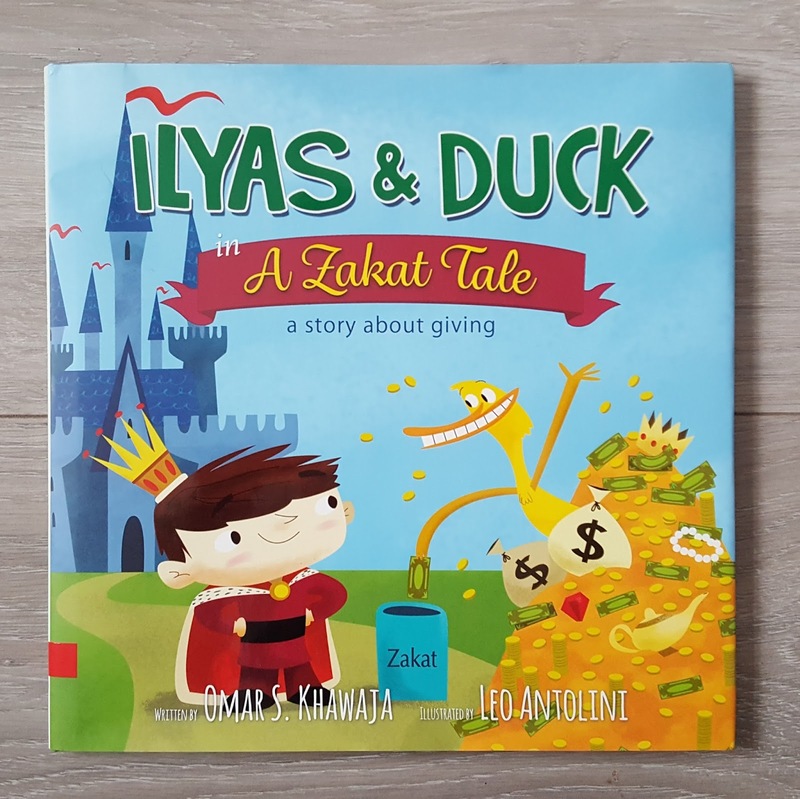 This charming book, sets out to explain to young children the importance of giving zakat (charity). This is a concept children often ask about. Why should we give our money away? Who do we give it to? 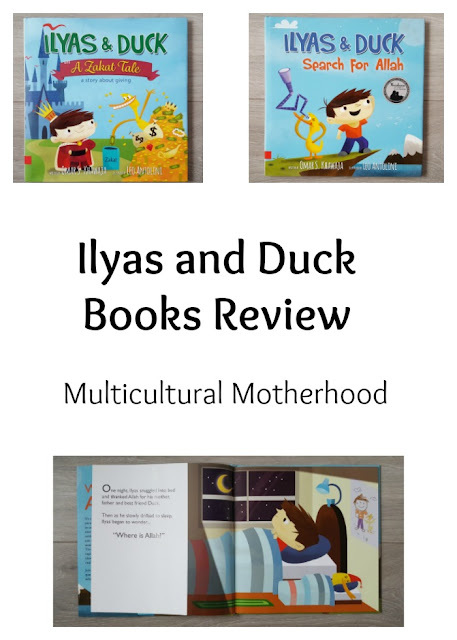 These are the questions Duck asks and Ilyas explains. The story begins with Ilyas sorting his money out into pots in the garden. Duck asks him what he is doing and then shows Ilyas his own savings. When Ilyas asks him how much of his savings he is going to give away to charity, Duck looks worried. Why should he give his money away? Ilyas tells him the story of a fictional kingdom which began to turn bad because of people's greed. The king was sad at the way his people were behaving so tells them about Allah and what Islam says about sharing your wealth. He explains that when you share your wealth it helps everyone; the poor, the community and yourself. It is a win win situation. At the end of the tale, you can see how the kingdom did indeed improve when everyone's wealth was shared. The poor became less worried about being able to provide for themselves, the community became more productive as businesses improved and the whole community was happy as a result. At the end of the story you can see how Duck is eager to share his money after learning about the importance of zakat and how giving it can benefit everyone. This story is honestly one of the best books I have ever read. 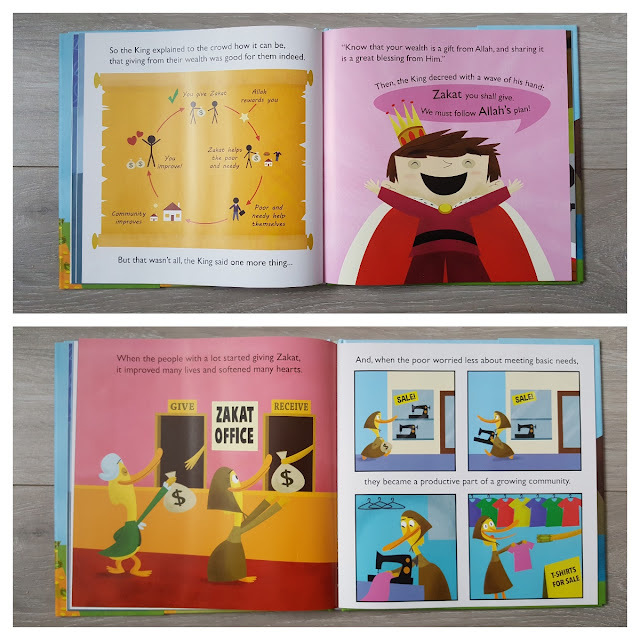 Not only does it teach children about the importance of giving, it also opens up dialogue with your children about charity and inequality in the world. I was astonished to see my five year old son's reaction to this story the first time I read it to him. He started to talk about a time, quite recently, where he had seen a homeless man in the street. He explained how he had felt sad to see the man sitting there and had wanted to help him. He was close to tears as he described his feelings towards the man and how unfair it was that we have a lovely, warm home while others have nothing. Why doesn't everyone have a house to live in? I explained that some people are not as lucky as us and that is why we need to give charity to help them. He said that next time he sees a homeless person on the street he would like to give them some money and he is now very keen to learn more about giving charity and helping those in need. I am so thankful that this book opened up this dialogue with my son and enabled me to learn about his thoughts and feelings on this subject. Without the book, this may not have happened! I am so impressed with these books. In fact, they are the best Islamic children's books I have come across and would be an excellent addition to your home library. They are a little pricey, but the quality of the books and the stories is second to none. I would recommend them to anyone with young children. Vouchercode for 10% off from Ibraheem Toy House! These amazing books can be purchased from Ibraheem Toy House, the UK's leading Islamic online toy store. Not only do they sell books, they also sell a wide range of toys, games and Islamic children's items. They even have a new range of baby and nursery products. 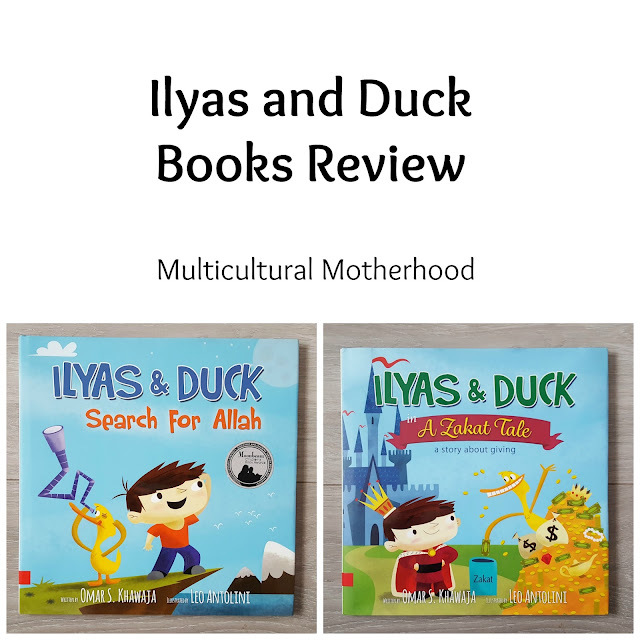 Ibraheem Toy House are offering 10% off the purchase of Ilyas and Duck books for 3 days only. Simply go to their website https://www.ibraheemtoyhouse.com/ and use the code ITH10 at the checkout. The code is valid until the evening of 29/10/2017.